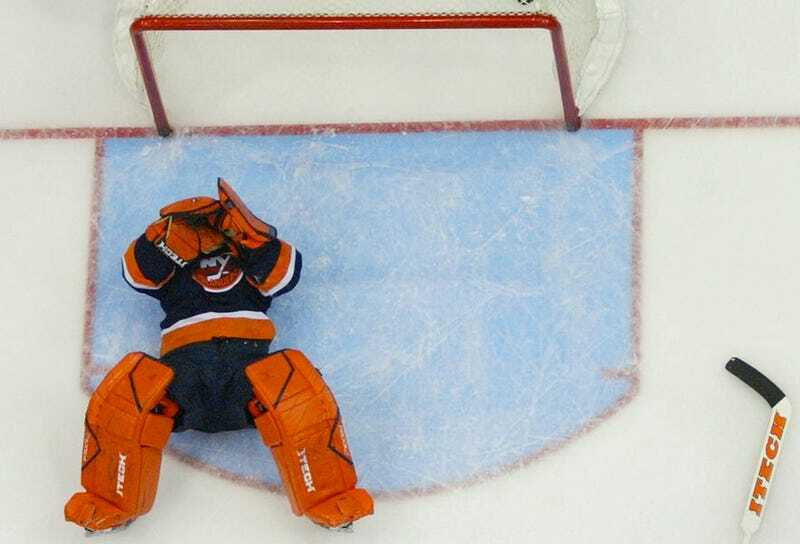 The other day, Barry reflected on the difficulty of Rick DiPietro's career as of late, and how at times his story has veered hard from farce to tragedy. For a rich man who plays a game for a living—when he's healthy enough to do so—hard luck has befallen DiPietro with maddening consistency. Rick DiPietro's first night back in the AHL was a short one. His Bridgeport Sound Tigers teammates left Connecticut players open all over the defensive zone in the first period of Friday night's 7-3 Whale win at the XL Center, and DiPietro allowed five goals on 12 shots. "I'm disappointed, obviously," DiPietro said. "It's really not the start or the result, I don't think, anyone wanted. Tomorrow is a new day. I'll get back on the ice tomorrow and just get better." Rookie goalie Kenny Reiter, who is on an AHL contract, replaced DiPietro for the second period. DiPietro attempted to move the puck away from his net on the backhand with three minutes left in the period, but it caromed around the front of the net, off teammate Kirill Kabanov's skate and in for the Whale's fifth goal in 11 shots. The Bridgeport Sound Tigers, having not yet won a game in the 2013 season, are the worst team in the AHL have won just five games since 2013 began, good for the 27th-best record in the AHL. If you see Rick DiPietro hanging around Bridgeport, buy him a beer.